The holiday season is officially underway. Your good cheer could quickly turn sour, though, if you don’t secure your browser before shopping online. Research from Qualys found that almost 40 percent of all browsers have critical vulnerabilities that could enable cyber criminals access to your personal data. Qualys CTO Wolfgang Kandek analyzed data gathered from more than 1.4 million Qualys BrowserCheck scans and discovered some alarming trends. Kandek found that 41 percent of Internet Explorer browsers, 35 percent of Firefox, and 40 percent of Chrome have at least one critical vulnerability. 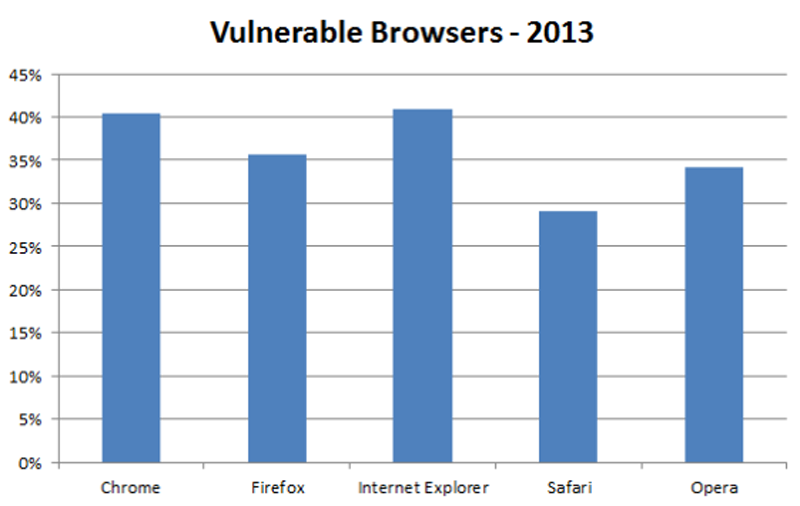 According to Qualys research, almost 40 percent of browsers have a critical security vulnerability. There are some masochists in the world who revel in the experience of fighting through crowded parking lots and jostling through stores shoulder-to-shoulder with other stalwart shoppers, but shopping from the comfort of home is less stressful and often more efficient. Forrester predicts online holiday sales will reach $78 billion this year—a 15 percent increase over last year. Shopping online, however, is one of the riskier things you can do from your browser. Completing a transaction typically requires providing a wealth of personal and sensitive information: name, address, email address, phone number, credit card number, credit card expiration, credit card CVV code, and more. If you stick to reputable retailers with secure, encrypted sites you can shop in relative safety, but if your browser has critical vulnerabilities that can be exploited by a cyber criminal, your information could easily fall into the wrong hands. All of the major browsers apply updates automatically by default, so hopefully your browser is current with the latest patches. However, add-ons, extensions, and plug-ins are often forgotten. Before you dive in to online holiday shopping, take some time to update your browser and all of its plug-ins to make sure you’re shopping securely.